I've been working a lot on my mental well being for the past month and I'm happy to say that I think the final 2015 blues are far away. It makes me joyous knowing I can say that with satisfaction and ease. In the mornings I see sunlight coming through the windows, flowers popping up outside and even though the air is cool it feels fresh and sweet. I can finally break away from my winter soup kick and move on to fresh warm meals for the Spring! Eeep! Tonight's meal is brought to you by the letter S, for Spice! I went a little overboard today but I'm happy to announce that it still turned out delightful and, of course, dairy-free. This one is also gluten-free. I had Pad See Ew last night from our local Thai place and that was enough noodle to last til the end of the month! I had a double trouble Harry Potter night with take out and dessert with my friend. We both regret nothing. We've been so active lately. Volleyball is over and we came in second for the championship. Not number 1 but we'll be ready for them next season... dum dum dum! 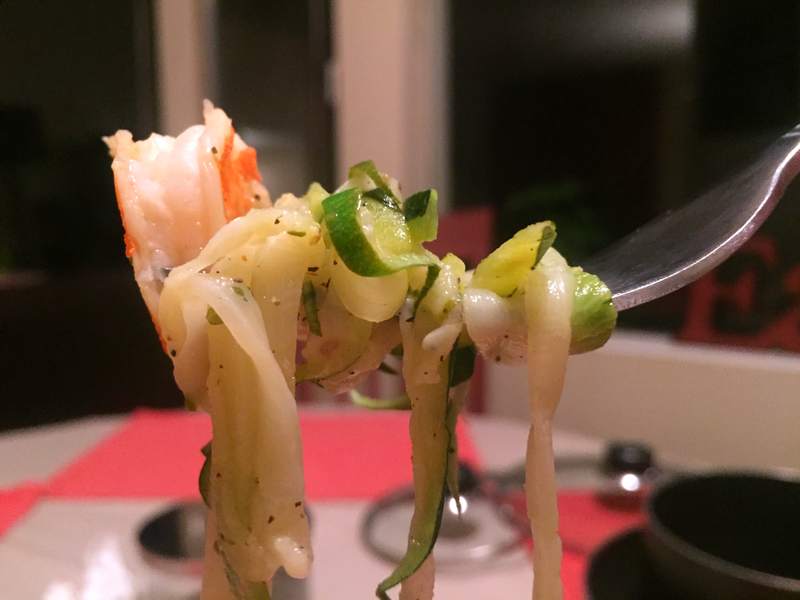 As for the Shrimp Scampi, zucchini is the substitute for noodles. As long as you don't over cook them they keep a terrific texture and soak up a lot of the spices and lemon. It also keeps the meal nice and light, not to mention clean. 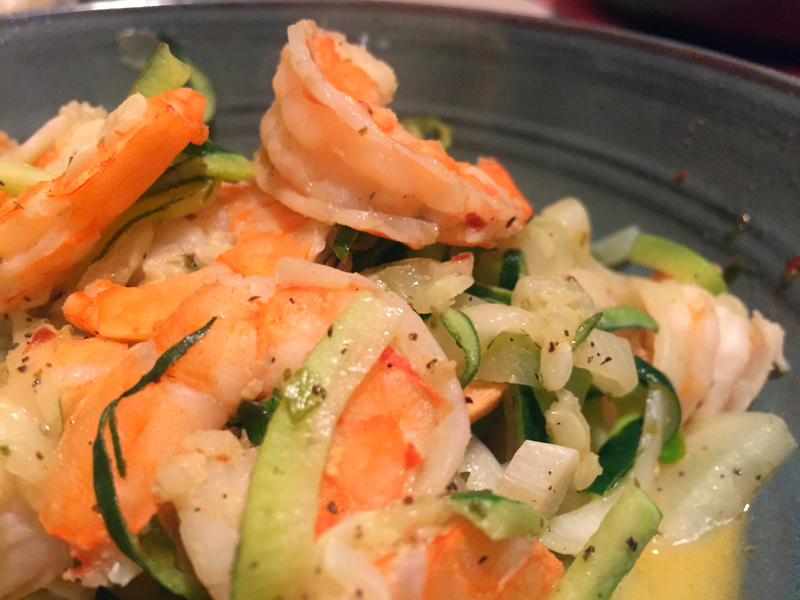 Add pre-cooked shrimp, red pepper flakes and oregano. Allow to simmer in faux butter and garlic for about 3 minutes and remove with tongs. Add zucchini noodles to the pan, along with the lemon juice and dash of cayenne (and pepper). Simmer for 5-7 minutes so the noodles soak up the juices. 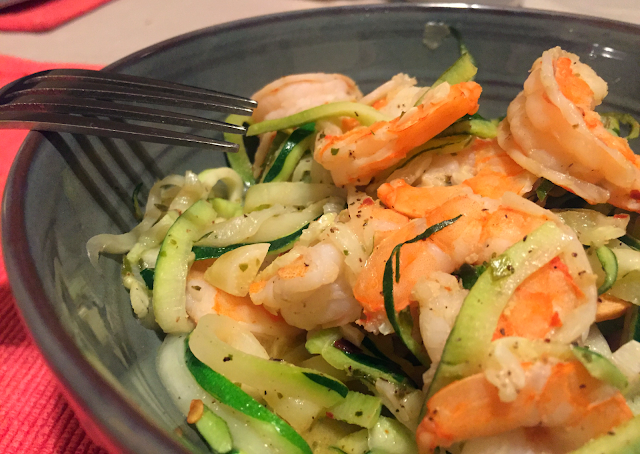 Add the shrimp again, mix and serve! Very easy and not a lot of mess. It look about 15 minutes to make all together. I love ended the day with a hot meal.